Top spinner may be defined as the ball which generally pitches in line or outside the off stump line (in good length) and over spins by moving straighter towards the wickets or turns little bit outside the off stumps after hitting the pitch.It has same action as the Great Leg Break has, but with different wrist positions and with different concept. It moves straighter towards the wickets or might turn slightly towards slip direction rather than moving extremely towards slip direction or third man direction (as it happens in genuine Leg break) after hitting the pitch. Top spinner may also be called as straighter one or Over Spinner. Generally the word Top Spinner is mostly used in Leg Spin bowling. Well, this delivery is also bowled in off spin bowling and we use the same word Top Spinner or straighter one. Now let us know why this ball is called as Top Spinner or Over Spinner ? Its simple, the reason is when you bowl a Normal Leg Break delivery it pitches (rotating with NW directed seam) in and around legstump line, and moves towards outside the Off Stump or towards the slip direction. That means in Normal Leg Break, the ball after pitching moves towards slip direction, but here in Top spinner the ball will be adjusted to move in straight direction. Therefore since the ball spins over the top rotating in forward direction with the seam up, infact moves in straight direction [straighter to wickets] after hitting the pitch, it is called as Top Spinner or Straighter One. 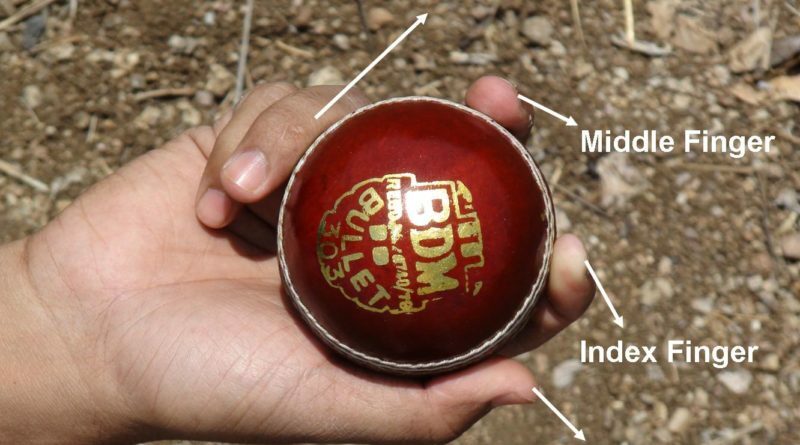 The seam of the ball rotates from Top to Down in front or forward direction with the thumb facing towards the batsman and back of the palm facing towards the sky at the time of releasing point. At the end of the day this is the reason why the concept of the word “TOP” is used in Topspinner. The speed of the Top Spinner generally will be same as Leg Break or would be little bit lesser on that instant. Generally Leg Break bowling speed ranges from 70 to 95 kmph. Suppose if your Leg Break bowling speed say averages at a speed of 85 kmph then the Top Spinner could be at a speed of 85 kmph or little bit less to that i.e (may be 75 to 85 kmph (at this instant)). At different speed instants of Leg Break we have different Top Spinner speeds. The speeds varies from Leg Break to Top Spinner (slightly) just simply because of different wrist and finger positions at the time of releasing point. Of course we do have same unorthodox action for Top Spinner (same as Leg Break), but the wrist and finger positions varies from Top Spinner to Leg Break, this varied positions makes Top Spinner little bit slower compared to Normal Leg Break. Its speed Normally ranges same as Leg Break or little bit lesser than that. It is a nice flighted and bouncing delivery. As it is a straighter one and doesn’t turn much, there are more chances for bowler to get lbws, catches (edges) in short fielding regions (forward short leg, silly point, etc..) and also sometimes getting them bowled. It can be bowled in any way, means, by finger based or wrist based. Bowl it in any way as long as it is straighter it will be still called as Top or Over Spinner. It has to be maintained in line and length because as it is straighter and slower the batsman can easily pull it for four or a six (if it is pitched shorter). That means the length is much crucial for Top Spinner just same as the Flipper. It looks like a Normal Leg Break ball with same action but moves straighter to wickets. You can get the sense of Top Spinner or Over Spinner clearly in Test cricket matches. Top Spinner was extremely used by Legendary Shane Warne. This was one of his best weapons. He demolished many English and South African batsman with this ball. He got number of lbw’s, caught behind in slips, in short legs, in silly points with the Top Spinner against English and South Africans. Top Spinner can be bowled in many ways as long as it is straighter. No matter in what way we bowl it. In general we do have many ways to bowl a Top Spinner. Hold the ball across the seam so that the fingers index and middle are on Top of the seam (across), the thumb and ring fingers are along with the seam (directed with the seam) nicely and comfortably gripping the ball. As it is said earlier that this action looks like same as Leg Break, now bowl it in unorthodox style i.e by reversing your arm and wrist, being on left side of the ball, the fingers index and middle on top of the seam (across)(seam facing in North direction), the thumb facing towards the wickets or batsman with the seam, the ring finger facing behind towards the sight screen with the seam at the time of releasing point. You have to bowl it in such a way that the arm has to be at an angle of 135 deg or may be more (generally) with the body, the position of wrist has to be rotated from basic 0 deg position to 90 deg position (generally) in such a way that the back of the palm has to face in west direction or cover region, the fingers index and middle on top of the seam (across), the other fingers thumb and ring are adjusted in such a way that the seam of the ball faces in straight or North direction towards the wickets at the time of releasing point. 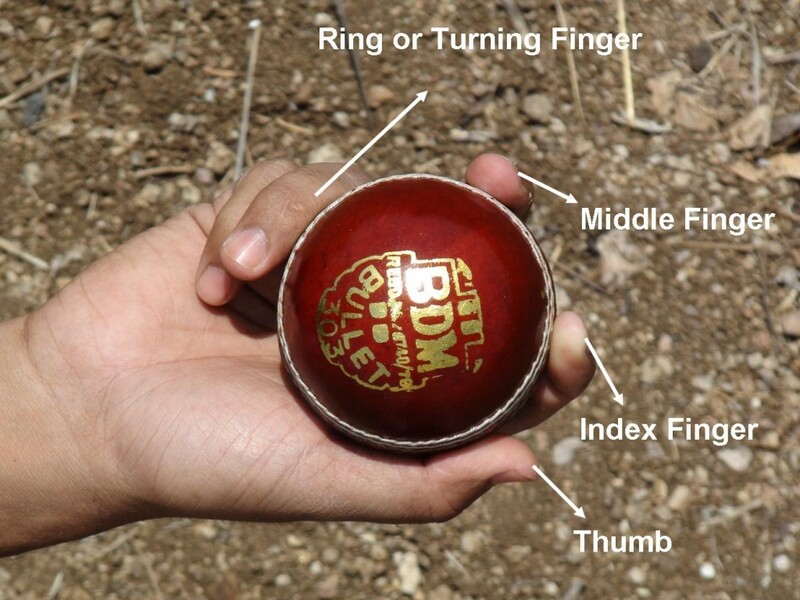 That means the thumb faces towards the wickets with the seam, the ring finger faces behind towards the sight screen with the seam at the time of releasing point. 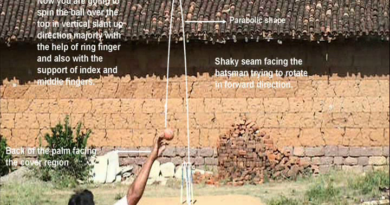 In that sense the thumb and mostly the middle and ring fingers will play a major role in rotating the ball in forward direction with the seam towards the wickets. So here when you observe the rotation of the ball very carefully after the ball has been released from hand, the ball rotates in forward or Straight direction towards wickets. These things can been observed very easily in slow motion replays especially in Test matches. After released from hand it hits the deck (ball rotating with seam up direction), here comes the concept “TOP SPINNER” , as the ball rotates in Straight or North direction, this directed “North Direction” seam of the ball makes the ball to move towards Straighter to Wickets after hitting the pitch. There by the word “Directed North seam of the ball” makes the ball to move straighter towards the Wickets. 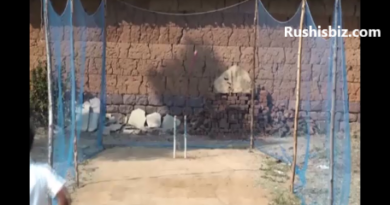 Therefore the ball moves Straighter towards the Wickets rather than it should have moved outside the Off stumps after hitting the pitch (Leg Break). At the end of the day this is how you got to bowl the Topspinner in the context of Legspin bowling. As we said earlier that the good length for spin bowling ranges from 2 to 6 yards, but if we go little bit deeper in to the concept the bowling length for Top Spinner would be slightly different when compared with Leg Breaks or Off Breaks. So why the lengths for Top Spinner is slightly different from Leg Breaks or Off Breaks. Let us discuss. When Normal Leg Break is bowled (generally) the ball pitches in line or in between middle and leg, then turns away from the batsman towards outside the off stump. As long as it turns enormously the length ranging from 2 to 6 yards is always good for Leg Break bowling. And I can assure you the length ranging from 0 to 6 yards could also become good if the ball turns even more enormously. From above you might get the sense the length for Leg Break also depends upon ,” How much does the ball turns after hitting the pitch “. Infact ” the spin of the ball after pitching can decide its length whether good or bad”. And also don’t forget, the length for Leg Break not only depends on “How much does the ball spins after pitching” but also the flight , the change of pace , the speed, the skidding factor, the fast drifting in air factor and other factors. We know that Top spinner is straighter and flighted delivery. And also its speed is slightly little bit lesser than Leg Break. The three factors flight, speed, straightening up can affect its line and length. So when you bowl a Topspinner on a length ranging from 5 to 6 yards or above 6 yards , as the ball is straighter, flighted and little bit less quicker this length could become shorter length for the batsman. There by the batsman can pull it away for a four or a six. So it should be bowled in between 2 to 5 yards . That is little bit fuller in length. Even more good length for Top Spinner could be 2 to 4 yards. Not only the length , the line is also very important for TopSpinner , because if you bowl in line and length (2 to 4 yards) as it is straighter and flighted , there are more chances for bowler to get lbw’s, edges in short fielding regions. The other very important factor for the Top spinner to be bowled in LITTLE BIT FULLER LENGTH is because the Fuller length gives no time for the batsman to decide ” what actually the ball is and in which direction does it moves ” as we bowl a TOP SPINNER which looks like Leg Break , he thinks it as Leg Break and plays for Leg break and gets demolished by TOP SPINNER. (The time and speed difference of the ball between “after hitting the pitch and before hitting the bat” will be less in Fuller length compared to shorter or Good length). These length factors are also applicable to and similar to LegSpin weapons such as Flipper, Googly, Slider, Change of pace etc. The other very important factor for bowlers is Leg Break bowling. By bowling just Top Spinners you don’t get wickets . The key is always Leg Break as it is said earlier. Bowl continuously and continuously Leg Break at least 2 to 3 in a row , then shift on to Top spinner that to in line and length (2 to 4 yards) then it effects you as a bowler and gets the real meaning for Top spinner. Similarly to Top spinners the Googlys, the Flippers, Sliders, Skidders, Shooters cannot be bowled continuously, the Leg Break has to be always play a major role and then shift on suddenly to these weapons, that to in line and length then it effects you as a Good Bowler and gets the real meaning for these weapons.